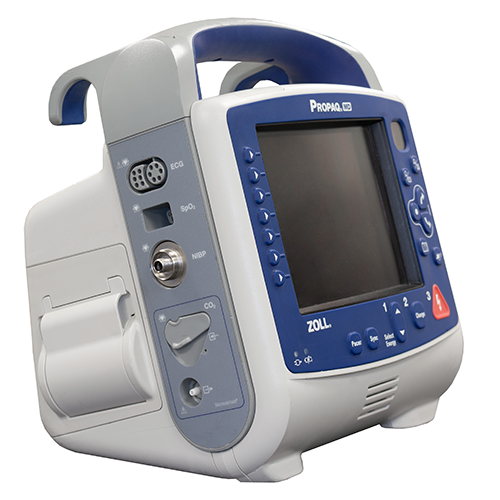 The Propaq MD is an ultra-lightweight, airworthy monitor/defibrillator that provides advanced monitoring capabilities, including full Masimo® Rainbow SET technology. The Propaq MD adds defibrillation and pacing to the Propaq monitor you know and trust—yet weighs less than the Propaq 206. Exceptionally rugged and reliable to withstand hostile environments, the Propaq MD is engineered to meet military and airworthiness standards. Designed with the user in mind, it’s intuitive and easy to use. At the push of a button, it transforms from a basic, user-friendly vital signs monitor to the most advanced and comprehensive monitoring device available. The Propaq MD can display up to four waveforms simultaneously as well as a full 12-lead ECG for on-screen review. Plug and Play technology maximizes clinical efficiency. The hot swappable 6-hour battery provides twice the operating time of your current Propaq.